Dr. Gopal is an Assistant Director, Cardiovascular CT Imaging, and Dr. Budoff is an Associate Professor of Medicine and the Fellowship Program Director, Division of Cardiology, the Los Angeles Biomedical Research Institute, Harbor-UCLA Medical Center, Torrance, CA. Dr. Akincioglu is an Assistant Professor, Department of Nuclear Medicine, The University of Western Ontario, London, ON, Canada. Traditional CT imaging of the chest in the acute setting has been extremely valuable in the diagnosis of pulmonary embolism (PE) and aortic dissection but is unable to provide accurate or detailed information on cardiac structures because of limited temporal resolution and motion arti-fact. 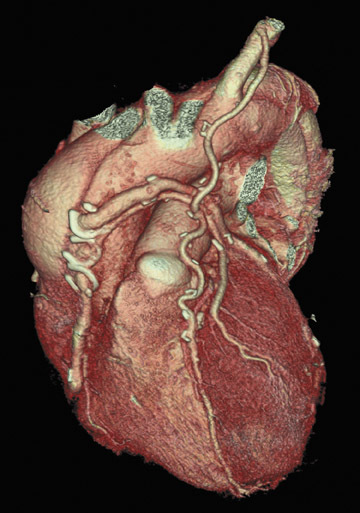 8 Significant advances have been made in the field of cardiac imaging, particularly in the ability to view the coronary artery lumen with sufficient diagnostic accuracy. This is quite an accomplishment, as noninvasive coronary angiography has been challenging, given rapid cardiac motion, small and tortuous vessels, concomitant calcification, and overlying veins. These factors have required imaging modalities used for noninvasive coronary angiography to possess both high temporal and high spatial resolution. Cardiac CT is now a robust technology for the noninvasive assessment of a spectrum of cardiovascular disease processes and is poised to become a noninvasive method to evaluate the lumen of the coronary arteries. One of the most important advances has been faster gantry rotation speed resulting in better temporal resolution and better z-axis spatial resolution made possible by thin collimations with extensive volumetric acquisition. 9 The new 64-detector multidetector computed tomographic (MDCT) scanners provide fast scan times, improved cardiac gating options, and isotropic resolution, which provides 3-dimensional (3D) information free of superimposed tissues or interference, resulting in uniform resolution throughout. The 64 detectors yield a 3D data set: for example, near isotropic voxels of 0.35 × 0.35 × 0.5 mm 3 that could be rotated in any given plane without loss of resolution. Coronary artery calcium has been shown to be highly specific for coronary atherosclerosis and adds incremental prognostic data to traditional cardiac risk factors. 13 Coronary calcium scores (CCS) are easily obtained at the time of the CT. The absence of coronary calcium (CCS of 0) has an extremely high negative predictive value for the presence of obstructive CAD in patients older than 40 years. 14 Conversely, the presence of CAC in a symptomatic patient cohort is associated with adverse outcomes. There are situations, however, where obstructive atherosclerotic disease may exist with a low CCS, especially in younger patients with comorbidities such as diabetes. 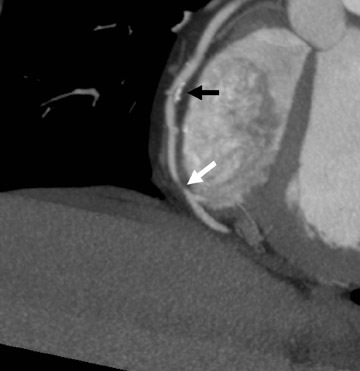 CT angiography in these patients may reveal the presence of noncalcified or "soft" plaques, reinforcing the need for aggressive medical therapy in this patient subset. 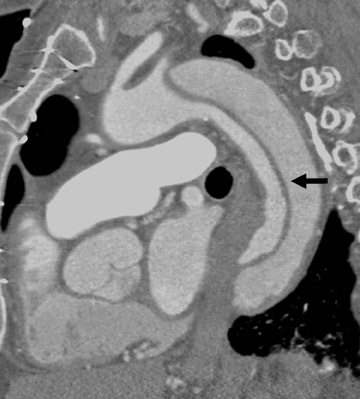 The advent of 64-detector MDCT (64-MDCT) offers the clinician in the ER setting a powerful tool to evaluate acute cardiovascular disease, evaluating both calcific and noncalcific plaque. CT angiography using 64-MDCT can accurately evaluate a number of cardiac, pulmonary, and vascular pathologies. In addition to performing the so-called triple rule-out (to detect CAD, aortic dissection, and PE), CCT can evaluate other cardiac disease states that are relevant to the clinician who is making acute diagnoses. These disease states include deep venous thromboses (DVT), cardiomyopathies, and pericardial disease. 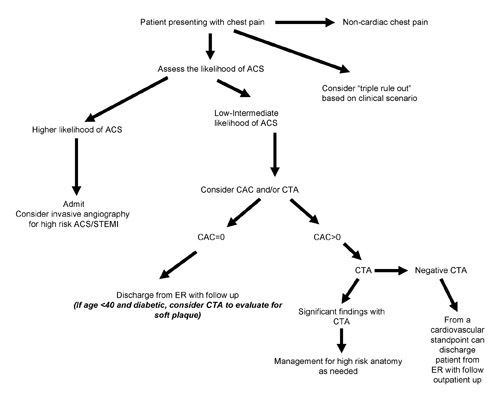 This review will discuss the role of CCT in the evaluation of patients with acute cardiac disease and will propose an integrated algorithm for the work-up and risk stratification of these patients. 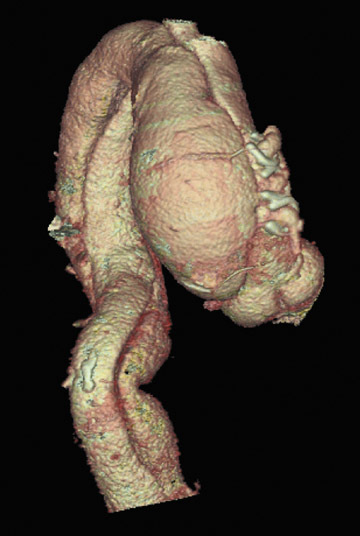 A single scan for both pulmonary and coronary applications is challenging. The timing of contrast must be optimized differently for PE evaluation (right heart filling) as compared with coronary artery and aortic assessment (left heart opacification). To visualize both pulmonary arteries and coronary arteries simultaneously, a long contrast infusion is necessary, allowing simultaneous opacification of the right- and left-sided structures of the heart. The coronary arteries will not be optimally visualized for interpretation in CTA that is performed to evaluate the presence of PE, as the bright contrast in the right ventricle and superior vena cava may obscure portions of the right coronary artery. Two issues make it difficult for a single acquisition to encompass the coronary and pulmonary vasculature. The extended anatomy to be imaged is one consideration, the injection rate is another, and the acquisition timing a third. While we normally want the primary part of the bolus in the arterial phase in the heart for the coronary arterial system, we want the bolus earlier for the pulmonary arteries. Usual timing for a PE study is to inject 60 to 70 mL of contrast at 4 mL/sec and begin scanning when the contrast reaches the pulmonary outflow tract. The contrast typically reaches this point within 8 to 12 seconds from the start of the injection, and ECG triggering is normally not required for this examination. For optimal acquisition of the coronary arteries, a typical injection is 70 to 80 mL of contrast at 5 mL/sec followed by a 60-mL saline flush. The authors use bolus timing in this setting and begin scanning when the contrast is at equal density in the ascending aorta and in the pulmonary outflow tract. This typically occurs approximately 23 to 27 seconds after the start of injection. For a triple rule-out examination, the difficulty is timing the contrast, taking into account the 10- to 12-second difference between the 2 phases. To accomplish this, either flow rates are slowed down or total contrast volume is greatly increased. A more prudent approach has been suggested. 16 This would entail performing CCT in the usual manner, with acquisition of the heart using retrospective gating, with a radiation dose between 12 and 15 mSv, with administration of 60 to 80 mL of contrast. Then, a CT to evaluate the pulmonary arteries (thicker slices, not retrospectively gated) can be performed, with approximately 40 mL of contrast and a radiation dose of 4 to 6 mSv. This allows for a reduction of radiation dose, requires no increase in contrast administration, and provides 2 optimal studies, instead of 1 suboptimal study. Perhaps the greatest benefit of 64-MDCT technology is the improved imaging quality of the coronary arteries and plaque assessment in the chest pain patient (Figures 1 through 3). In a recent study, the specificity and sensitivity for the detection of significant coronary stenosis (defined as >50% luminal narrowing) for 64-detector CTA of the coronary arteries compared with conventional coronary arteriography was 91% and 92%, respectively. 20 When compared with 16-MDCT, 64-MDCT offers faster scan times, fewer image artifacts, and better evaluation of distal vessels. Optimal image quality is obtained with slower heart rates (<65 bpm), which often requires the use of intravenous or oral beta blockade. The use of beta blockers, of course, may not be suitable in certain patients. A "positive" CTA for significant coronary artery or bypass graft stenosis would be of value to the interventional cardiologist, who can then focus on treating the culprit vessel in the cardiac catheterization laboratory without adding unnecessary fluoroscopy time. This is particularly helpful in patients who have anomalous coronary arteries and atypical anatomy of native coronaries and bypass grafts (Figure 4). 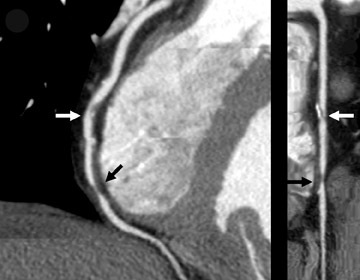 Limitations of MDCT interpretation occur in calcified arterial segments and in segments with stents, which may cause a multitude of artifacts. Gallagher et al 21 compared the accuracy of CTA with that of stress nuclear imaging for the detection of an acute coronary syndrome or 30day major adverse cardiac events (MACE) in low-risk chest pain patients. This was a prospective study of the diagnostic accuracy of myocardial perfusion imaging and MDCT in low-risk chest pain patients. The target condition was an acute coronary syndrome (confirmed >70% coronary stenosis on coronary artery catheterization) or MACE within 30 days. The patients were at low risk by the Reilly/Goldman criteria and had negative serial ECGs and cardiac markers. 21 All had both rest/stress technetium-99m sestamibi myocardial perfusion imaging and MDCT. Patients with abnormal stress nuclear imaging results (reversible perfusion defects) or MDCT results (stenosis >50% or calcium score >400) were considered for cardiac catheterization, and those with discordant results had a reevaluation (including ECG) by a cardiologist more than 30 days later. All patients were followed for evidence of MACE within 30 days by review of hospital records and structured telephone interviews. Primary outcomes were the accuracy of MDCT and myocardial perfusion imaging for the detection of an acute coronary syndrome and 30-day MACE. Of the 92 patients, 7 (8%) were excluded because of uninterpretable MDCT scans. Of the remaining 85 study patients (median age 49 ± 11 years, 53% men), 7 (8%) were found to have the target condition, with all having significant coronary stenosis (88% ± 9%) and none having myocardial infarction or MACE during 30 days. Stress nuclear myocardial perfusion imaging results were negative in 72 (85%) patients, and MDCT results were negative in 73 (86%) patients. The sensitivity of stress nuclear imaging was 71% (95% confidence interval [CI] 36% to 92%), and MDCT was 86% (95% CI 49% to 97%), and the specificity was 90% (95% CI 81% to 95%) and 92% (95% CI 84% to 96%), respectively. The negative predictive value of stress nuclear imaging and MDCT was 97% (95% CI 90% to 99%) and 99% (95% CI 93% to 100%), respectively, and the positive predictive value was 38% (95% CI 18% to 64%) and 50% (95% CI 25% to 75%), respectively. The authors concluded that the accuracy of MDCT is at least as good as that of stress nuclear imaging for the detection and exclusion of an acute coronary syndrome in low-risk chest pain patients. Acute aortic syndrome (AAS) refers to the following life-threatening aortic emergencies: penetrating atherosclerotic ulcer, acute thoracic aortic injury, intramural hematoma, dissection, and aneurysm leakage. 22 MDCT offers several advantages over other imaging modalities in the diagnosis of acute aortic syndrome. 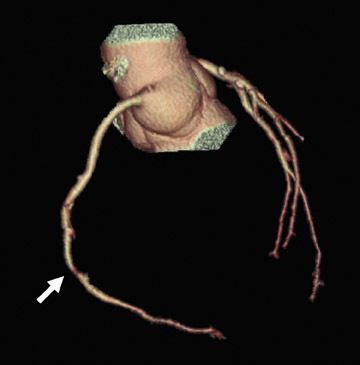 Imaging can be obtained quickly and non-invasively. Other imaging modalities, such as transesophageal echocardiography, provide excellent imaging capability but are invasive and require an experienced operator who is readily available. This discussion will be limited to acute aortic dissection. The use of CT for the diagnosis of PE has been well established, initially with helical CT technology. 25 MDCT offers additional technical refinements and highly detailed visualization of the pulmonary vasculature. 26 The contemporary generation of scanners outperforms helical CT and has the added advantages of speed, ability to image sixth-generation vessels, and the capability to perform combined imaging of the lower extremity venous system for DVT. 27 The traditional belief that invasive pulmonary angiography is the "gold standard" for this diagnosis is under debate as a result of this technological improvement (Figure 7). A large multicenter study of PE was recently completed using both CTV and CTA. The use of CTA alone for the detection of PE had a sensitivity of 83% and a specificity of 96%. Adding CTV to CTA significantly increased the sensitivity to 90%. 36 This study mainly used 16-detector scanners. The expectation is that the use of 64-MDCT will improve sensitivity and provide very high negative predictive values (>98%). The use of CCT with 64-detector technology is a useful and powerful tool in the evaluation of the acute cardiac patient (Figure 8). The challenge remains in integrating this modality within the traditional work-up of cardiopulmonary disease. Many patients can be spared further invasive and costly testing with early risk stratification and imaging of a lower risk patient subset. It should be noted that patients presenting with noncardiac chest pain related to musculoskeletal or esophageal disease would be unlikely to benefit, diagnostically speaking, from CT imaging. Therefore, they require appropriate clinical management and would be candidates for early discharge and outpatient follow-up. Calcium scanning by either electron-beam CT or MDCT requires only a small radiation dose. The 0.6- to 1.2-mSv dose scan is similar to an abdominal X-ray and is at least half the radiation dose of invasive angiography. However, MDCT angiography imparts a significantly higher radiation dose to the patient (approximately 8 to 13 mSv). 38 With dose modulation (turning the X-ray beam down during systole when images are not as diagnostic due to motion), the dose is reduced by 18% to 47% depending on the patient's heart rate. 39 This moderate radiation dose must be considered when patients are selected for a CCT study. It must be kept in mind that the dose given during CTA is similar to that given during technetium-99m myocardial perfusion imaging protocols 40 ; therefore, this should not be considered excessive for the evaluation of CAD. The use of cardiac CT in the emergency room, with its very high (99%) negative predictive power for obstructive coronary artery disease, PE, and aortic dissection, should allow for an expedited work-up of chest pain patients. This unprecedented accuracy will be attractive to ER physicians. However, the appropriate use of cardiac CT in the ER must be considered in each patient. While younger women on birth control pills with chest pain may have PE in the diagnosis, the likelihood of coronary artery disease and aortic dissection approaches zero. Thus, such patients should not get a complete "triple rule-out" study, with associated higher radiation doses and contrast requirements, but rather a targeted evaluation of the problem. Appropriate utilization will lower healthcare costs and reduce radiation exposure to patients. Limiting the use of this new technology to appropriate patients may prove harder than some CCT experts anticipate. Cardiac CT in the emergency room. Appl Radiol.